The remains of a Native American woman preserved for 2,000 years has been discovered five feet under the asphalt of a main road in Davie, Fla., after a routine archaeological inspection mandated by state law. 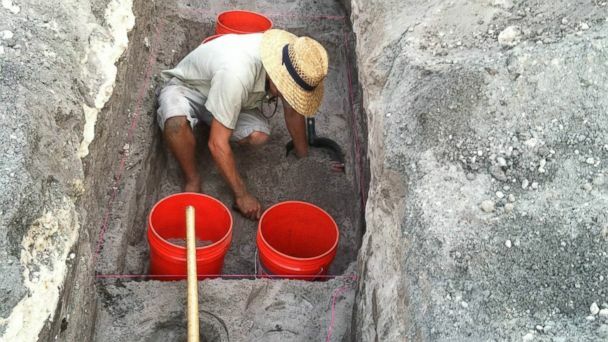 Ryan Franklin, a bio-archaeologist, uncovered the remains of a woman who is believed to have been a member of the Tequesta tribe. "It was pretty exciting to find," Franklin told ABC News today. When the archaeological team was summoned to Pine Island Road during the excavation of a construction site, they first found a couple of loose teeth, Franklin said. Loose teeth are interesting, "but anybody can lose teeth," Franklin said. On Dec. 18, not far from the loose teeth, emerged a big toe. "When you find a toe, there's a good chance there's something else going on," Franklin said. "We found the toe, which became a foot. We had to stop and contact the state," Franklin said. Once they got the go-ahead to excavate further, the team uncovered the rest of the body within one week of discovering the tip of the toe. The remains had a few fractures and broken bones, but her condition was close to perfect, Franklin said. "She was almost perfectly intact, which is unusual. Usually when we find graves that are this old, the acidity of the soil can deteriorate the bones, it was unusual given her age," Franklin said. Bob Carr, the executive director of Archaeological and Historical Conservancy, Inc., in Davie, said the discovery is "rare." "There have only been five or six burials found in the last 20 years or so," Carr told ABC News. Her remains were found exactly where the water main on Pine Island Road was going to be placed. "There are probably more graves on either side of the trench but we left those alone," Carr said. Through analysis, the archaeologists found that she was about five feet tall, and buried when she was just 20 to 30 years old. There was no evidence of trauma, suggesting her cause of death was disease-related, according to Carr. Being that she is about 2,000 years old, given Davie's history, archaeologists concluded the woman belonged to the Tequesta tribe. Out of respect for the tribes in the region and state law, pictures of the skeletal remains could not be shared. After further analysis and documentation, she will be re-interred by the conservancy in a secret location sometime this month. Broward County, Fla., is one of the few places in the country where they still have conservancy laws to protect these prehistoric sites through the monitoring of construction projects.